In the condition known as degenerative disc disease, the discs located between the vertebrae (otherwise known as intervertebral) discs have deteriorated, narrowed or been damaged or degraded in some fashion; or perhaps their nerve roots become pinched. This phenomenon most frequently strikes the most mobile regions of the neck and lower back. Discs can thin out, bulge or rupture, or the material lining the outside of the disc (annulus) can fall apart or deteriorate. According to WebMD, cervical degenerative disc disease (Cervical DDD) affects about 25% of people without symptoms under age 40, and 60% over age 40. This is truly more of a condition than a disease, however, it can and does contribute to various diseases. Older people lose water in their tissues, which makes collagen less flexible and elastic throughout the body. As your spinal discs are normally elevated in aquatic makeup, this water loss can damage the core of and the fibers surrounding the vertebral discs. Common courses of treatment include therapy, medication, and artificial disc replacement surgery. Degenerative disc disease can lead to serious conditions such as spinal stenosis (the narrowing of the spinal column), osteoarthritis of the joints, as well as spondylolisthesis (exorbitant slippage of the vertebrae). Let’s say that, during an exercise session, you experience a pain flare up that either eases to the level of low-grade pain or disappears entirely in the wake of a rest period. This may be a symptom of degenerative disc disease. Severe instances of back or neck pain are other indicators of degenerative disc disease. These episodes even might last for days or months at a time, spelling chronic pain for that patient. Different patients suffer varying levels of degenerative disc disease. Some will have no or mild pain, while others will suffer prolonged intervals of intense pain. Questions about degenerative disc disease? How does degenerative disc disease cause pain? 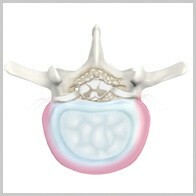 Abnormal micro-motion takes place when the material lining the outside of the disc (the annulus) disintegrates, destroying its ability to cushion the daily shocks that strike between vertebrae. While not as serious as a slipped vertebrae, abnormal micro-motion can prompt muscle spasms and worsen back pain. Spinal discs consist of a sizable quantity of protein. When the exterior part of the disc disintegrates, this protein is released and may agitate the nerves surrounding, causing inflammation. The resulting pain can spread into the buttocks and legs if the source of inflammation is traced to the lower back (lumbar) region. If inflammation strikes the neck (cervical) area, pain may lash out into the shoulder, the arms and at times the hands. Inflammation can also produce painful muscle spasms. If you recognize the signs and symptoms of degenerative disc disease, you should schedule an immediate consultation with Dr. Payam Moazzaz. He will assess and diagnose your condition along with its severity and degree. Only then will he be able to treat the issue and relieve your pain. To make an appointment, please call today.